So I’m doing some last minute packing today—cleaning out the fridge a little and going through the cabinets that seem to have endless depth to them; and what do I find, but several (more) bags of ready-to-make baked goods mixes. Yes, the kind that you can get in any rustic part of the country and at mills that still function; historic sites seem to also be rather fond of selling them at gift shops. My advice: Stop buying these as gifts. The next time you find yourself eyeing up those perfect little sacks of flour, reconsider your options. Personally, I like to receive cheese as a gift. Unlike cheese, all they do is clutter up my already disastrous cabinets, and sit there for years because I either convince myself that I’ll really make them, or feel bad for throwing it out because it’s a gift and/or an otherwise perfectly useful food product. That just leads to re-gifting in order to avoid throwing out food and then I look like the guilty party. No, I will never make those English scones, or the blueberry pancakes, or the cranberry scones, or the waffle mix for which I have no waffle iron. 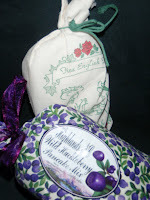 I have never made scones in my life—that will not change because of the lovely cloth gift sack. Nor do I know of anyone who has made a baked good from any of these mixes, though I would love to hear from someone who has. I also have never met anyone from South Dakota, but that doesn’t mean they don’t exist. And if you are a regular gift mix buyer (who probably is not laughing at this), don't feel bad about your past mistakes, just learn from them. But back to the whole packing ordeal--that means that I’ll be leaving town for a while, but fret not. I will continue to keep you updated for the next few weeks from the sunny land of happiness that is St. Thomas. Expect some delays due to travel and indolence.